Nearly two in five charity communicators feel the recent challenging media environment for the sector has meant an increased value placed on comms. Asked what impact the intense media scrutiny of charities over the past year has had on others’ perception of the value of the communications/marketing role, 39% said it has increased slightly, according to the CharityComms/TPP Recruitment Charity Marketing & Communications Salary Survey 2016. This increased understanding of the value of comms may account for a very slight upward lift in salaries across the sector. A “focus on corporate reputation from boards [is] driving salaries up,” according to one respondent. Salaries of marketing and communications professionals in charities remain largely static, with 59% of respondents seeing their salaries stay the same. This is an improvement on last year, when 65% said their pay packets hadn’t changed. There’s been a corresponding increase of 5% in the number of respondents who say their salaries have increased a little in the past year (29%, up from 24%). Other reasons given for slight increases in salaries include a “growing awareness of the importance of communications, but a sense that it's still undervalued compared to marketing or sales,” according to one respondent. A “need to increase brand awareness in such a crowded space,” was cited by another. “Colleagues and senior leaders are slowly understanding the importance of these specialised roles,” said a third. This resonated with others: “Senior management is more aware of the importance of our roles. Additionally, the external landscape is making comms more important.” And some are seeing an “increased recognition of the contribution marketing and comms has on promoting services and attracting funding”. There’s a welcome “realisation that competition is getting tougher and marketing gives competitive advantage”. When asked more generally about perceptions of the value of comms, outside of the negative media spotlight, 52% said it had become more valued (simlar to last year's 54%). For those who feel the perceived value of comms has stayed the same (38%), there are other benefits: “The role is no more nor less valued but people remember to talk to us more and to talk sooner,” was one wry comment. 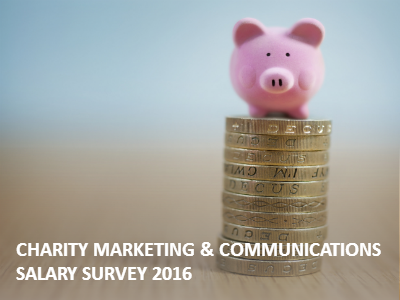 The Charity Marketing & Communications Salary Survey 2016 aims to benchmark salaries across the sector and was completed by 792 respondents in April/May 2016. It is compiled by TPP Recruitment in conjunction with CharityComms. Download the full report here.